What do I need to know to choose the right turbocharger for my tuning, racing or performance project? 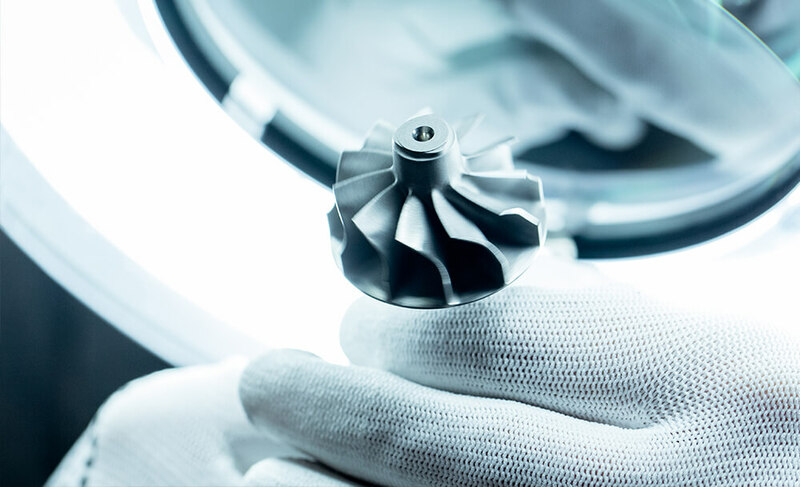 Imagine the ability to match a turbo to your engine, right from the palm of your hand Garrett® Boost Adviser is a tool developed to perform a turbo match quickly and easily. 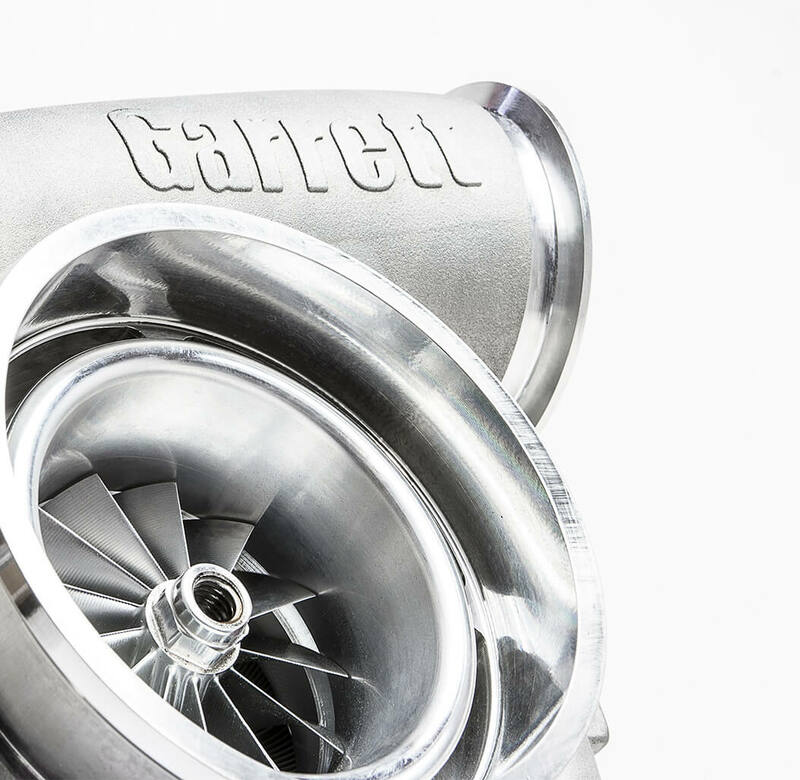 Enter a few parameters for your engine and your horsepower goal and in a matter of seconds, the Garrett® Boost Adviser will provide you with the turbochargers that closely meet your inputs. It also guides you to the nearest distributors available to buy the matched turbo.  You could even email the results to yourself for review or share them on your Facebook page. What do I need to know to choose the right diesel upgrade turbocharger? The amount of power that a diesel engine makes is directly proportional to the amount of fuel injected into the cylinder and that fuel needs sufficient air for complete combustion. For smoke-free performance, the engine needs about 18 times more air (by mass) than fuel. So clearly, as more fuel is added, additional air needs to be added also. In most applications, the stock turbo has some additional capacity for increased power, but as the compressor reaches the choke limit (maximum flow), the turbo speed increases rapidly, the efficiency drops dramatically, and the compressor discharge temperature ramps up very quickly. This creates a “snowball” effect in that the higher discharge temps mean higher intake manifold temps and higher exhaust gas temps. The lower efficiency means that more turbine power is required to reach the same boost causing higher back pressure in the exhaust manifold. This can usually be seen on an engine with a performance chip (at the highest power setting) and maybe an intake or exhaust upgrade. Under heavy acceleration, smoke is pouring from the tailpipe as the EGT’s and turbo speeds are climbing into the danger zone requiring a prudent driver to back off the accelerator pedal early to keep from damaging the engine. Under these conditions, the stock turbo is running on borrowed time. With an upgrade turbocharger selected to compliment the extra fuel, smoke is drastically reduced, EGT’s are under control and, since the turbo is operating in a more efficient range, horsepower and drivability are enhanced. When the modifications get more serious, a bigger turbo is a must have to compliment even more fuel. In order to decide on the appropriate turbocharger for your diesel engine, the very first thing that needs to be established is the power target. 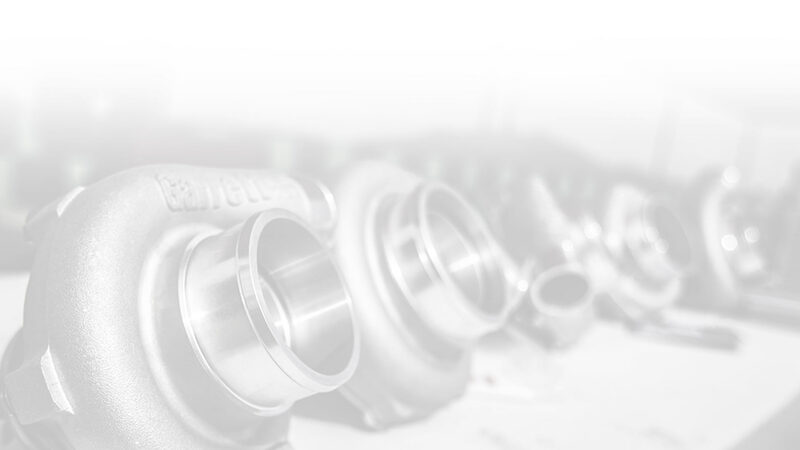 Since turbochargers are sized by how much air they can deliver and airflow is proportional to engine power, a realistic horsepower goal is critical to make the right choice. Great, so what turbo do I choose? Let’s take each case and calculate a turbo choice based on the intended power increase. The first step is to read the Turbo Tech Expert section. 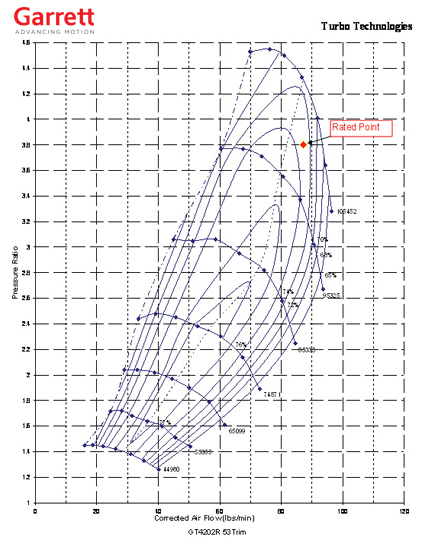 This article explains the reading of a compressor map and the equations needed to properly match a turbo. The examples given, however, are for gasoline engines, so we are going to work some additional examples here using those same equations but with a diesel engine. Matches will be calculated with an Air Fuel Ratio (AFR) of 22-to-1 for low or no smoke performance. Likewise a typical Brake Specific Fuel Consumption (BSFC) is in the range of 0.38. See the Example tag to get started! The first example will be for the Daily Driver/Work Truck/Tow Vehicle category. This includes vehicles up to 150HP over stock. But wait, this power level can be accomplished with just a chip or tuning module. So why bother with a new upgrade turbo? An upgrade turbo will enhance the gains made by installing the chip and other upgrades. 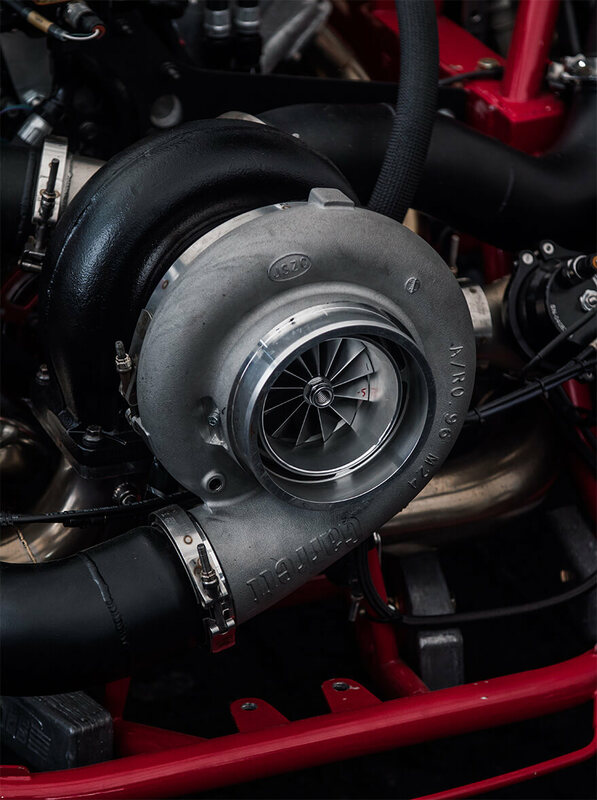 The extra air and lower backpressure provided by the upgrade turbo will lower EGTs, allow more power with less smoke and address durability issues with the stock turbo at higher boost pressures and power levels. Because this will be a mild upgrade, boost response and drivability will be improved across the board. So we will need to choose a compressor map that has a capability of at least 59.2 pounds per minute of airflow capacity. Next, how much boost pressure will be needed? Calculate the manifold pressure required to meet the horsepower target. So now we have a Mass Flow and Manifold Pressure. We are almost ready to plot the data on the compressor map. Next step is to determine how much pressure loss exists between the compressor and the manifold. The best way to do this is to measure the pressure drop with a data acquisition system, but many times that is not practical.  Depending upon flow rate and charge air cooler size, piping size and number/quality of the bends, throttle body restriction, etc., you can estimate from 1 psi (or less) up to 4 psi (or higher). For our examples we will estimate that there is a 2 psi loss. Therefore we will need to add 2 psi to the manifold pressure in order to determine the Compressor Discharge Pressure (P2c). To get the correct inlet condition, it is now necessary to estimate the air filter or other restrictions. In the Pressure Ratio discussion earlier we said that a typical value might be 1 psi, so that is what will be used in this calculation. Also, we are going to assume that we are at sea level, so we are going to use an ambient pressure of 14.7 psia. We will need to subtract the 1 psi pressure loss from the ambient pressure to determine the Compressor Inlet Pressure (P1). We now have enough information to plot these operating points on the compressor map. First we will try a GT3788R. This turbo has an 88mm tip diameter 52 trim compressor wheel with a 64.45 mm inducer. As you can see, this point falls nicely on the map with some additional room for increased boost and mass flow if the horsepower target climbs. For this reason, the GT37R turbo family is applied on many of the Garrett Powermax turbo kits that are sized for this horsepower range. For the next example, let’s look at the Weekend Warrior.  This category is for daily driven vehicles that have up to 250 horsepower over stock or 525 wheel horsepower. Looking at the previous map, the compressor does not flow enough to support this requirement, so we must look at the next larger size compressor. The next larger turbo is a GT4094R and is shown below. Another option that could also be considered is the GT4294R which has a slightly larger inducer compressor and the next larger frame size turbine wheel. The larger wheel inertia’s will slow down the response a bit, but provide better performance at the top end of the rpm range. For the next example, let’s look at the Extreme Performance.  This category is for real hot rod vehicles that have up to 350 horsepower over stock and owners that are willing to give up some of the daily utility in order to achieve higher power gains. 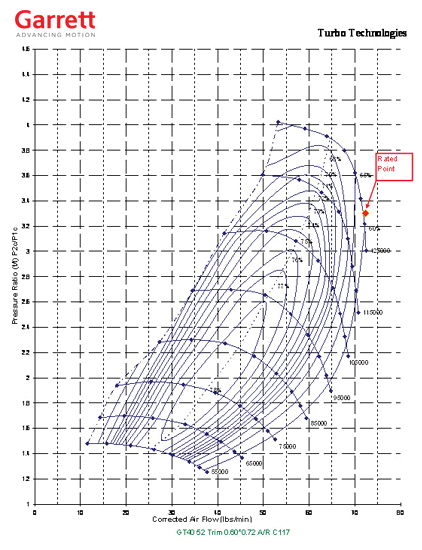 For this flow and pressure ratio, the GT4202R is appropriate and is shown below. Since this is approaching a pressure ratio of 4-to-1, we are about at the limit of a single turbo on an engine of this size. This air flow rate will apply only to the low-pressure compressor as the high-pressure compressor will be smaller because it is further pressurizing already compressed air. In most cases, the high-pressure turbo tends to be about two frame sizes smaller than the low pressure stage. So in this case, after selecting the appropriate low-pressure turbo (hint: look at the GT4718R compressor map), a GT4088R or GT4094R would be the likely candidates. One more comment on choosing a properly sized turbine housing A/R. 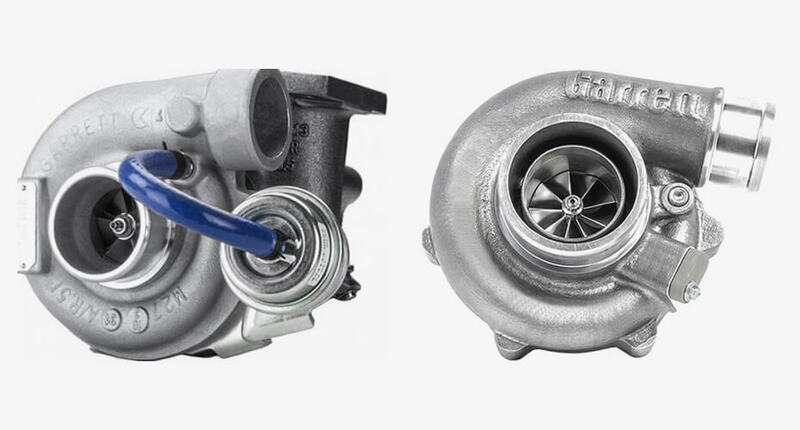 A smaller A/R will help the turbo come up on boost sooner and provide a better responding turbo application, but at the expense of higher back pressure in the higher rpm zones and, in some cases, a risk of pushing the compressor into surge if the boost rises too rapidly. On the other hand, a larger A/R will respond slower, but with better top end performance and reduced risk of running the compressor into surge. Generally speaking, the proper turbine housing is the largest one that will give acceptable boost response on the low end while allowing for more optimal top end performance. 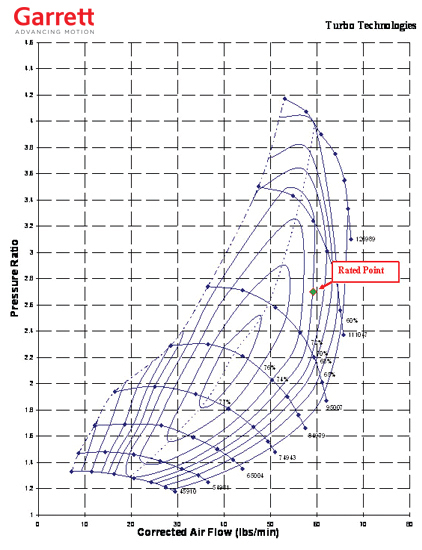 This information should be used as a starting point for making decisions on proper turbo sizing. Of course, for more specific information on your engine, consult a Garrett Powermax distributor.